After the disappointment of Anna Birch's Call The Vet, my appetite was whetted for a good "My First Year As An ..." book. I had a poke around Amazon's "People Who Bought ... " suggesters and found this one, Vet on the Loose by Wicklow vet Gillian Hick. I hadn't previously heard of her, which is either surprising given the size of the place, or perfectly understandable given that I don't actually watch Irish TV, or read Irish newspapers, or interact with anything Irish if I can possibly help it. I was sold by the end of the prologue. Any story about castrating a horse which includes a young man showing enthusiasm for the testicles with the words "If I put dat in me sister's bed tonight it'll scare de shite ota her!" is going to be for me. Vet On The Loose treads the expected path of a newly qualified Irish vet, more specifically that of a female vet at a time when women were still rare in the profession: the beginning of the 21st century. There are stories of the everyday sexism she faced (farmers asking when the real vet was going to arrive etc) which, having lived in Ireland for a good while, I buy totally. There are stories of Dublin council estates, posh Equine hospitals and bachelor hill farmers, and unlike Call the Vet, the stories centre on the cases. To a James Herriot devotee such as myself a couple of them tread familiar ground - there's no wine bottle *uncrosses legs* but we have mention of the sugar trick. However, it's done with enough of its own identity to feel fresh and one one them has the best punchline in the whole book. The writing, in particular, is excellent and Hick's ear for dialogue spot on. She manages with the smallest of details to show us her clients - and herself; I can *hear* the accents. Comic writing is tremendously difficult to do well and Hick is funny, educational and engaging. As it was mentioned in a few of the reviews I read, I'll confirm there is some spoken profanity but it's never the crux on which a joke hinges, merely a nod to an accurate representation of character (although there is not nearly enough to actually *be* accurate). As I'm me, I'll complain that the funniest stories were all in the first half which led to an uneven experience as a whole, but to be honest there isn't a duff chapter in the thing. 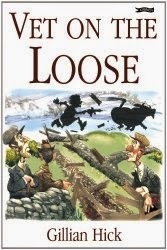 Vet On The Loose deserves to have a wider audience that it does - it's published by The O'Brien Press who are small and Irish so you're unlikely to find this in your local bookshop, but - as I mentioned - it's currently £1.19 on Kindle and more than worth it. Hick has a second book out, Vet Among the Pigeons, (which I have already borrowed from the library), and I really, really hope she finds the time to write a third.